At first he may look scary, but he's the kind ogre that everyone would adore, bring Shrek and his friends to your theme party! 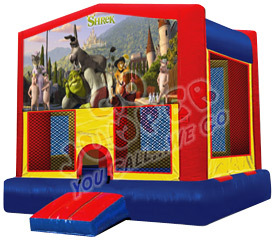 We from BounceHousesForRent.com will provide you with this new and clean Shrek Theme Jumper. Our price includes delivery, setup, and pickup within our delivery area. We serve parts of Los Angeles County and Orange County, California.